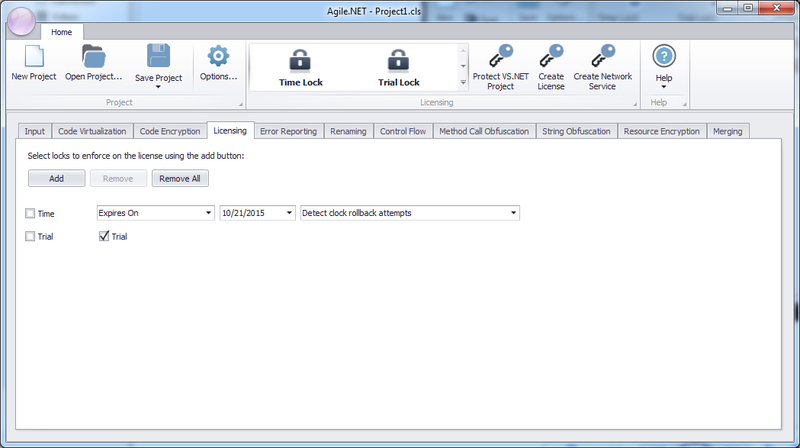 Agile.net uses locks to control usage of the protected software, the term lock defines a constraint that needs to be validated for the license to be recognized as legitimate and thus to allow usage of the protected software. Each license may contain different locks, giving different users of the software different levels of access to the protected software, each license can contain any number of locks that define exactly how the user may use the software. Agile.net support a variety of locks, each one defines a different type of restriction that is enforced by it. License creation is managed through the licensing tab available from the main form. Select any one of the locks from the locks gallery on the licensing tab of the ribbon. Modify the properties of the lock to fit your specific needs. Press create license button available from the ribbon. Specify the license key used to sign the license, the license keys selected should match the license keys selected when setting up the project file using the Project Wizard. Save the license to a file or copy its string representation if you'd like the user to enter it manually during the license registration process.